[September 27, 2007] In a remarkable work of scholarship, the Art Institute of Chicago brings an extraordinary work on American architecture to the internet. 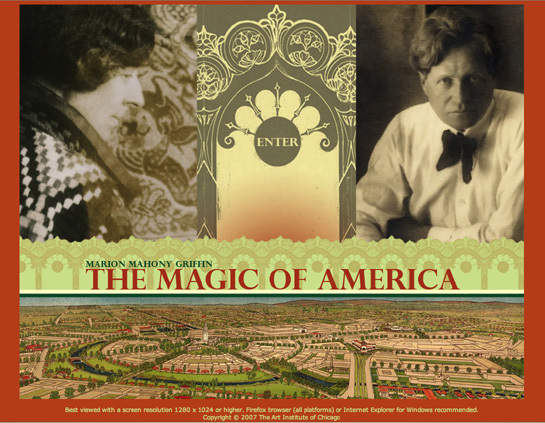 Near the end of her long life, living in a house at 1946 West Estes in Chicago, Marion Mahony (1871-1961) finished her magnum opus The Magic of America as a loving tribute to the life and work of her late husband, architect Walter Burley Griffin. What emerges from its pages, however, is nothing less than a vivid portrait of an era, spread across two continents, America and Australia, a highly personal account of the birth both of modern American architecture and urban planning, and - by reflection and inference as much as directly - of Mahony Griffin herself, one of the most remarkable and enigmatic figures in American architecture. Now, in an extraordinary work of scholarship, the Art Institute of Chicago has created an equally remarkable The Magic of America website. The AIC owns two of the only three copies of Mahony Griffin's manuscript (the other is at the New York Historical Society), but because of its fragile condition, it has been accessible only via microfilm - until now. Now you can read the entire 1,400 pages of Mahony's manuscript, and view all of the original 650 photographs and illustrations, on-line. You can view the work in several forms: a reproduction of the original typewritten text, complete with handwritten emendations; in a text version; or as a downloadable, fully-searchable Acrobat file. Read the introduction to the project here. Many believe that Mahony Griffin's renderings were a significant influence on the early architecture and success of Frank Lloyd Wright, for whom, as a draftsman, she served as his first employee. According to one source, half of the renderings in the Wasmuth Portfolio, which made Wright's work known to the world, were hers. Wright would later disparage Mahony's contribution, and mock the talent of Burley Griffin, also a Wright employee at the time he and Mahony met. In Magic of America, Mahony Griffin returns the favor. Rarely mentioning him by name, Wright is instead described as an "incubus", a man "who, although he has artistic feeling, is really not an architect at all though he is quick on the uptake." "The Chicago school died not only because of the cancer sore in it - one who originated very little but spent most of his time claiming everything and swiping everything . . ."
The "so-called architect whose vanity and malice killed the so-called Chicago movement in architecture." 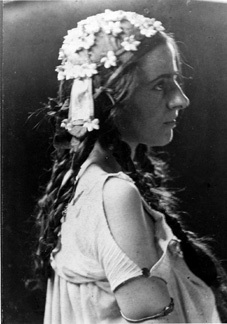 Mahony tells of Wright ordering from her a series of sketches for a 2-story, 3-bedroom house. Mahony talks the result as a "a revolutionary design, abandoning the universal parallelogram, T shaped, and center reception entrance hall dropped to ground level." She says she later saw Wright claim the design as his own as he resold it to a later client. Mahony also writes of the period in 1909 when Wright abandoned practice, wife and children in Oak Park and fled to Europe with Mamah Borthwich Cheney, the wife of a neighbor. 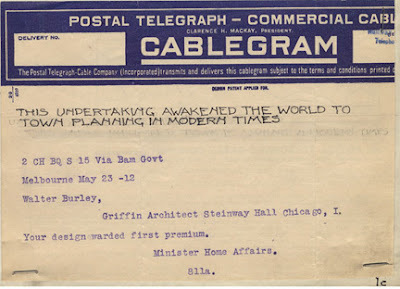 "Later that architect went abroad," Mahony writes, again carefully avoiding the mention of Wright's name. "He asked me to take over the office for him. I refused. But after he had gone, Mr. von Holz who had taken over asked me to join him so I did on a definite arrangement that I should have control of the designing. That suited him. When the absent architect didn't both to answer anything that was sent over to him the relations were broken and I entered into a partnership with von Holz an Fyfe. For that period I had great fun designing." The second great phase of Mahony's career became when she encouraged Walter to enter a competition to design a new national capitol in Canberra, Australia. The wire that would change both their lives is reproduced in Magic. Mahony recounts Griffin's battles in realizing his vision. "The architects, especially of Melbourne, are jealous." The bureaucracy was entrenched. She quotes a local's observation that "the whole civil service is rotten in every Department." Her feelings about her country's position in the world could have been written today. "There is a strong anti-American feeling here for one aspect of which Theodore Roosevelt is responsible in his pompous sending around the world of the U.S. fleet with its flip assurance which of course he had no business to make, that if Australia ever needed assistance the U.S. fleet would be on hand to help." Magic includes an extended section on Mahony Griffin's landmark studies of Australian flora, resulting in her beautiful series of gel lithographs, Forest Portraits, many of which were exhibited at the Block Museum in Evanston in 2005. "The first vivid picture of a personality inflexible, indomitable, is a baby boy following his mother about the garden patting the flowers as he went. It hurt him to have flowers picked, hurt him as it does others to see a bird's wing broken . . . "
"When Walter works at the private office I go the sleep on the couch, when he has to work at the Federal Office I stretch out on his desk and sleep there till he is ready, which is usually half past eleven or twelve. Then we trail home looking like a couple inebriates. Sometimes he sleeps on my shoulder, sometimes I sleep on his." Overflowing, idiosyncratic, often raw and unwieldy, you can try to read it from start to finish or you can dip in and out, but odds are you'll find The Magic of America to be one of the most remarkable texts in American architecture. Explore it here, and read my own extended account of Mahony's life and work here. From the Art Institute acknowledgements: The team responsible for bringing The Magic of America to life in electronic form consists of: Joel Cronkite, Library Assistant; Christine Fabian, Conservator, and her staff, along with Barbara Korbel, former Conservator; Edward T. Fishwick, Project Editor; Curtis Osmun, Systems Librarian; Nathaniel Parks, Assistant Archivist; Patrick Rogers, former Digital Technician and Joe Tallarico, Digital Technician in the MacLean Visual Resources Center; Mary Woolever, Archivist, Ryerson and Burnham Archives; and the entire staff of Ryerson Library department of technical services. The project was made possible by financial support from the Vernon and Marcia Wagner Library Access Fund and from members of the Committee on Libraries at the Art Institute of Chicago.